Visit our winery and vineyard adjoining our bed and breakfast. We grow French and American hybrid grapes. Drive 3 miles West of Hotchkiss on Hwy 92. 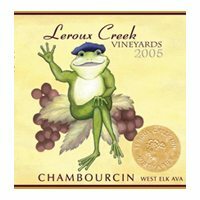 Look for the blue sign “Leroux Creek Vineyards.”Visit our winery and vineyard adjoining our bed and breakfast. We grow French and American hybrid grapes. Drive 3 miles West of Hotchkiss on Hwy 92. Look for the blue sign "Leroux Creek Vineyards." 11-5 Tuesday-Sunday, or by appointment.